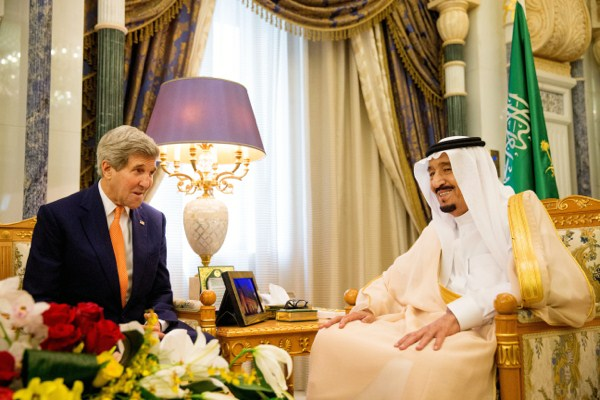 U.S. Secretary of State John Kerry meets with Saudi Arabia’s King Salman at the Royal Court, Riyadh, Saudi Arabia, May 7, 2015 (AP photo by Andrew Harnik). Last week, Saudi Arabia’s new monarch, King Salman, replaced Crown Prince Muqrin—who had been chosen by Salman’s predecessor, the late King Abdullah—with 55-year-old Mohamed bin Nayef as next in line to the throne. He also installed his own 29-year-old son, Mohamed bin Salman, as deputy crown prince. The royal shuffle was presented by palace loyalists as an attempt to stabilize Saudi succession for the next few decades, consolidate power and inject what King Salman seems to believe is a greater sense of stability in the kingdom’s internal affairs. But it also marks an important shift in the monarchy’s trajectory. Although it remains unclear to what extent this consolidation may destabilize internal royal politics, it is sure to have ripple effects throughout the Middle East and in bilateral relations with the United States.